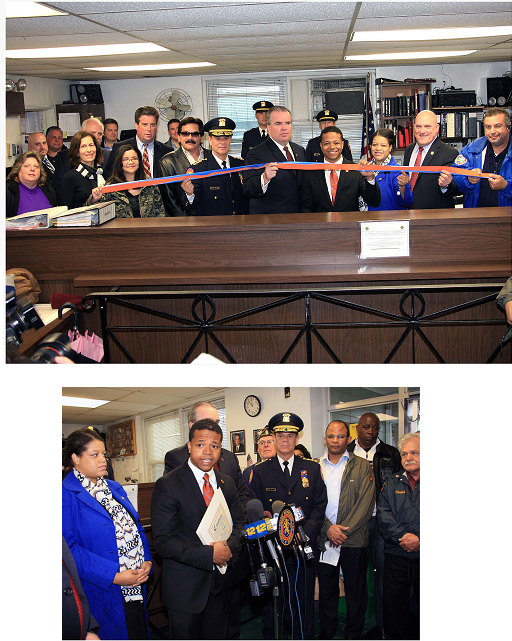 (Elmont, NY) – After more than three years of tireless advocacy by Legislator Carrie Solages along with Elmont and Western Nassau community leaders, Nassau’s 5th Precinct re-opens with much applause. In March 2012, the Republican-controlled legislature approved the consolidation of Nassau’s police precincts, forcing the Fifth Precinct -- one of the busiest in the County -- to shut its doors. Community activists reacted by organizing rallies in protest of the County’s consolidation program, specifically calling for the immediate re-opening of the Fifth Precinct located on Dutch Broadway in Elmont, less than a mile from the Nassau/Queens border. As Legislator Legis. Carrié Solages (D-Elmont), stated in Newsday’s April 19, 2015 article entitled “Nassau’s Fifth Police Precinct in Elmont to reopen”: "I'm happy that we prevailed." Solages said: "There was really no cost savings . . . This challenged the relationship -- the officers were less visible. You can't deter crime if you don't have a visible presence." Carrie Solages was surrounded by community activists who were celebrating today’s victory. Nassau County Commissioner Krumpter along with Nassau County PBA president Jim Carver were also in attendance. “While the road was a long and hard one, I am glad we’re here and I thank the Mangano administration for reopening our precinct today,” shared Solages. “This great day was brought by a lot of hard work that resulted from the tireless work of a community and labor partnership. I am forever grateful to our community and civic leaders for bringing the voice of our community front and center. I am also thankful to PBA President Jim Carver and his members for working with us and fighting to ensure our police are given the tools to succeed,” concluded Solages. For more information, please contact Lauren Corcoran-Doolin at (516) 571-6280 (office) or (516) 640-6933 (mobile) LCorcoran@nassaucountyny.gov.